Are you super busy? Have too many things to do, and so little time? I have the perfect casserole for you. It is my Weeknight Ground Beef Casserole. You are going to love this simple and tasty recipe for ground beef. Right now, the holidays are in full swing, and perhaps you find it hard to make dinner every night. Nothing says family like sitting down together for a meal prepared by your hands. Sure, you can go out, but how about a casserole that tastes great the first evening, and reheats well if you want to take it to work, or enjoy it for another night. I have a solution for you. 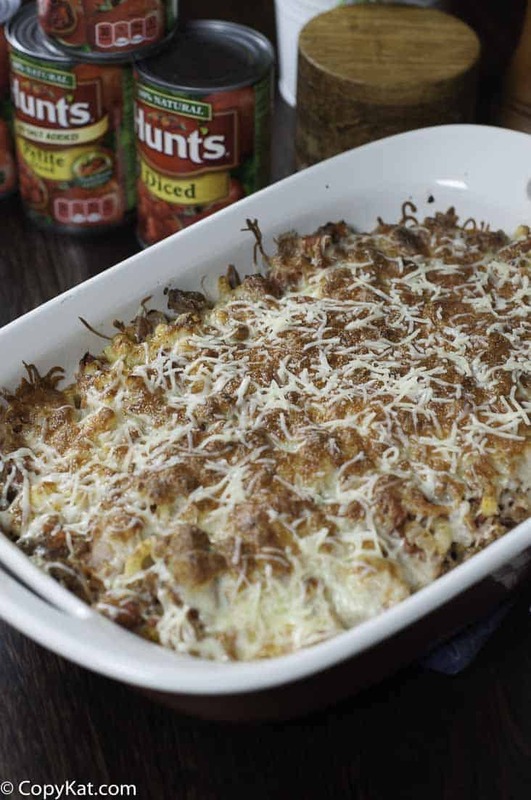 My Grandmother used to make a delicious casserole with ground beef, bacon, two types of cheese, and tomatoes. This casserole always tastes as good as a hug feels. 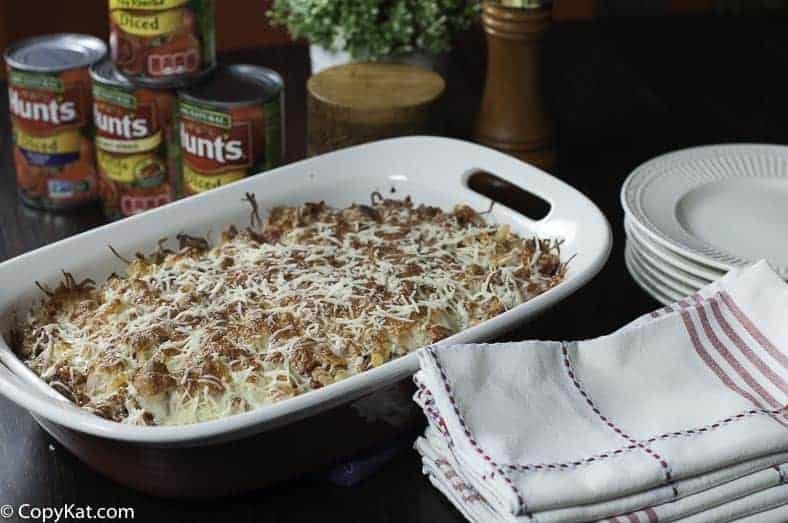 I don’t know what it is about this casserole, but it is simply macaroni you cook, add a pound of ground beef, chopped onion, and some bacon, and cheddar, and provolone cheese, and you have one delicious casserole. For this recipe, I used I used a couple of cans of Hunt’s canned tomatoes that I got at Walmart. I love the fresh flavor of Hunt’s canned diced tomatoes. You can find many different varieties of Hunt’s diced tomatoes come in all sorts of flavors, garlic, fire-roasted, spicy, and even tomatoes with green pepper, celery, and onion at Walmart. The variety of flavors these tomatoes come in make them perfect for recipes. There is one thing about using canned tomatoes is that they are always in season! Hunt’s tomatoes are grown under the warm sun of Oakdale, California, and then they are peeled by steam, so there are no chemicals involved. You can feel good about using Hunt’s tomatoes. I always keep a few cans of diced tomatoes on hand. If I need sauce, I can puree them in my blender to make the sauce. In this casserole, the tomatoes add a good fresh flavor and help to bind together the dish. If you want you can swap the pasta for gluten-free pasta, whole wheat pasta or even a low-carb pasta to make it fit your diet. 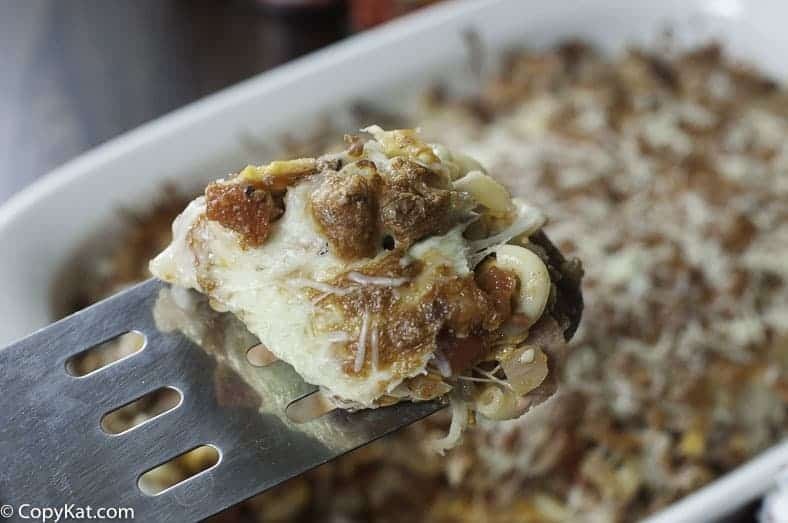 If you wanted to you can add in canned mushrooms, you could do this recipe with chicken if you desire, be creative, and you can whip together this casserole in no time. Are you looking for more great ground beef recipe ideas? Be sure to check out these recipes. This casserole is perfect for a weeknight, it reheats beautifully. In a large skillet brown ground beef over medium heat. Season meat with salt and pepper while cooking. Be sure to crumble the beef into small pieces. When the beef is done, drain and set aside. Boil pasta according to package directions. While the pasta is cooking, dice bacon. In the same skillet where you cooked the beef, add bacon and onions. Cook the bacon until it is fully done, and the onions are translucent. In your casserole dish combine pasta, two cans of diced tomatoes(do not drain the cans) , ground beef, onions, and bacon. Stir to combine. Top with casserole dish with both kinds of cheese. Bake in a 350-degree oven until the cheese is melted. You may want to brown the cheese by turning on your broiler function for a moment or two. So glad you enjoyed the smell! I made this reciped on Sunday and it is absolutely delicious! My husband and I were quite impressed with the flavors. Not many spices but goodnes……does this ever taste good! We will certainly have this again and again! Awesome recipes … must try. Please help me! The fetticini sonora pastadish with artichokes from the Paradise Restaurant in Torrance..I relocated from Calif to Texas and I miss my favorite dish….I need a fix! Can you help? I am begging ???? Have been treating to say thank you for all your great recipes over the years. Really appreciate all your time and effort. Great job and many thanks! This looks like a great recipe, simple ingredients, easy to prepare, just right for a busy week night. Thanks, Stephanie!